Beth and I are trying out something new this year. We are going to be Vendors at the annual Art & Soul Retreat right here in Hampton, VA on April 30. Do you remember last year when Vintage Sue and her Sis Michelle has a table at the A & S Retreat 2010? I stopped by that eve and was so blown away by the fabulosity of it all that I vowed Beth and I would be there 2011. We have been scrounging the best supplies and wares to offer on April 30 and included will be a sprinkling of our unique creations. 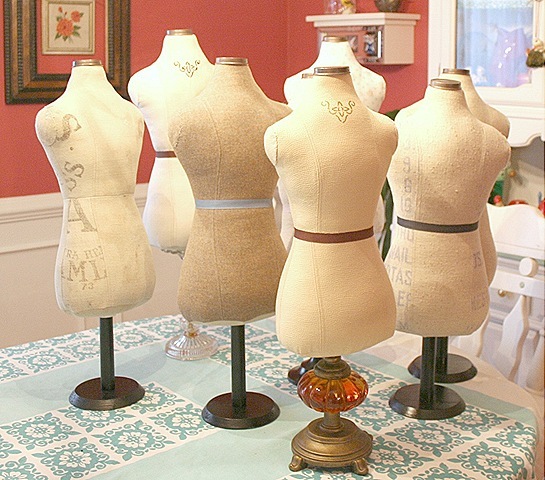 I'm going to have some dress form displays made especially for the A & S crowd. Even if you aren't attending the workshops you can join us on Saturday evening at the Hampton Convention Center in Hampton, VA from 6-9 pm. They even have a cash bar for your shopping pleasure!